The Planetary Society was founded by Carl Sagan, Bruce Murray, and Louis Friedman in 1980 as a voice in support of planetary exploration. I was in high school at the time and joined soon after it was founded. I remember an article in the society’s magazine The Planetary Report that discussed solar sails as vehicles for planetary exploration. The idea immediately grabbed me and I had an idea for a book about astronauts who traveled aboard a solar sail and made a sort of grand tour of the solar system much as NASA’s Voyager space craft was doing at the time. The novel was to be called Sailors on the Solar Sea. 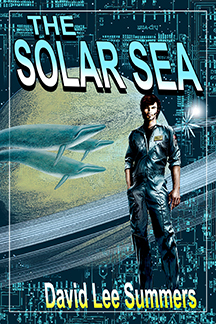 It took over twenty-five years for me to see a draft through to completion and the novel was finally published in 2009 with a shortened title: The Solar Sea. Now in 2018, I’m pleased to announce the release of the second, updated edition. In the novel, whales around the world changed their songs the day scientists announced the discovery of powerful new particles around Saturn’s largest moon which could solve Earth’s energy needs. The Quinn Corporation rushes to build a solar sail space craft to unlock the secrets of these strange new particles. They gather the best and brightest to pilot the ship: Jonathan Jefferson, an aging astronaut known as the last man on Mars; Natalie Freeman, a distinguished Navy captain; Myra Lee, a biologist who believes the whales are communicating with Saturn; and John O’Connell, the technician who first discovered the particles. Charting the course is the mysterious Pilot who seems determined to keep secrets from the rest of the crew. Together they make a grand tour of the solar system and discover not only wonders but dangers beyond their imagination. I started the novel soon after my mom bought me my first typewriter. It was a Smith-Corona electric and man that thing was nice. I remember sitting down for a couple of hours every weekend and savoring the hum of the typewriter and the tap-tapping as the ball hit the ribbon. I carefully saved those pages for many years. Jonathan Jefferson goes all the way back to the beginning. Natalie Freeman started as Nathaniel Freeman. I remember finding those early pages sometime in the early 1990s and feeling like there wasn’t enough of a plot to preserve, so I tossed the whole thing out. Around 2000, I made another attempt at the novel. I think I only succeeded in hammering out four chapters. That’s when Myra Lee and the whales came into the story. I grew up in Southern California and visited Marineland as a kid. My first job in astronomy was on Nantucket Island. Long before Captain Kirk saved the whales in Star Trek IV, I’ve been captivated by the idea of whale intelligence. In 2007, Jacqueline Druga-Johnston, who was then the owner of LBF Books, challenged me to try my hand at the National Novel Writing Month. I looked at what I had written before and didn’t like the direction I had been going with The Solar Sea, tossed that draft aside, and made a third go at it. In 2007, my youngest daughter was just getting ready to start Kindergarten. I wrote the novel in the evenings after the kids went to bed. I succeeded in writing 50,000 words in a month and felt satisfied that I had, essentially, a complete story. I took the next three months and revised the novel, adding about 13,000 more words and then submitted it to LBF for publication. The novel was published in early 2009. In the subsequent years, LBF was acquired by Lachesis Publishing. The novel is set in the near future, less than a hundred years hence. Despite that, the novel has mostly aged well and not become too dated, though there were a couple of places where I saw time rapidly encroaching on the novel. Also, in the years since the novel’s release, I’ve continued to learn more about solar sails and realized I could do better. Lachesis, for their own business reasons, didn’t want to invest in a new edition, so when the contract came up for renewal in 2017, I requested a reversion of the rights. The upshot is that I’m proud to announce the release of the newest edition this week. Although the new edition has been re-edited, I haven’t introduced any new plot points. Readers of the first edition should recognize it as the same novel with just a few updates to the science and technology. One nice new feature is that I worked with artist Laura Givens to create diagrams of the Solar Sail Aristarchus for the book. This past week, I’ve been reading and revising my rough draft of Owl Riders, getting in shape for beta readers and ultimately getting it ready to submit to my publisher. Despite the post’s title, the process hasn’t been hellish, but it does eat time. Owl Riders is the fourth novel in my Clockwork Legion series and the fun of this process is that I enjoy playing in this world. It’s because I enjoy it that I feel I have a responsibility to tell the story in the best way possible. I’m a believer that to succeed in writing, you need to sit down and write. As with my other recent novels, I wrote Owl Riders on my weeks off from my observatory job. Typically, I managed two chapters every other week. I didn’t worry too much about getting just the right words the first time through. I wrote from an outline to keep me on track and help me know where I was in the story, but I didn’t worry too much about tracking details. So my job this time around is to assure continuity, make sure I didn’t repeat facts I already conveyed in earlier chapters, and improve the prose so I tell the story in the best way possible. To do this, I employ a three-prong approach for each chapter. First, I make a pass through the printed manuscript, rereading and making changes. I also make notes of facts I should remember for later chapters. Some of these facts are just matters of maintaining consistency of small details through the novel. Some of these facts are things I’d forgotten I highlighted, but are fun to revisit later in the novel as the characters have grown. I recently acquired a copy of Scrivener, the book writing software from Literature and Latte. It’s been a great help keeping those notes handy so I can check them as needed. 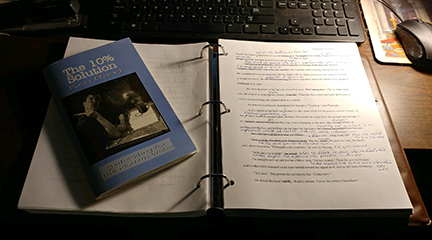 My second pass through each chapter uses a technique highlighted in the book, The 10% Solution by Ken Rand, which I’ve mentioned in other posts. My publisher also recommends following the book’s approach before submission. In short, the book highlights several common overused words (the infamous adverbs, the verb “to be”) and filler words (things like “of,” “about,” and “by”) that are all too easy to drop in your manuscript when you’re writing. The idea is to search for these words and then evaluate the phrase where it occurs and decide if you could find a better way to say it. I tend to catch a lot of this in the first pass, but searching always highlights more of these. The important thing about Ken Rand’s technique is that he doesn’t say you must make changes when you find these things. He just suggests evaluating the sentence and seeing if you can say it better. I usually make several revisions in this pass. My third pass is to read each chapter aloud. This helps me smooth out prose from the first two passes, helps me to hear where I may have repeated phrases, and I often catch important elements I either cut or never wrote in the first place. At this point, I’m about halfway through the revision pass. I hope to get more work done during my next break from the observatory. In this fourth novel, the Apaches have built battle wagons and they’ve carved out a land claim in Southern Arizona. Ramon is pulled into the conflict. Meanwhile, the man Fatemeh was once betrothed to in Persia seeks retribution for her decision to run away. If you haven’t already, be sure to read the first three novels in the series. The links below will take you to pages with more information and purchase links. All of the books are available in print and as ebooks. The first two novels are also available from Audible as audio books!